This IBM® Redbooks® publication is a comprehensive service-oriented architecture (SOA) offering that is designed to extend the IBM Business Process Management platform to deliver flexible composite business applications. 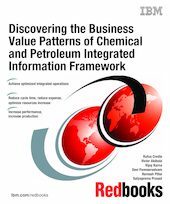 In this book, we provide the complete overview of the chemical and petroleum industry and solutions provided through C&P IIF that can help overcome the business challenges through value identification. This book covers the business and functional architecture of the chemical and petroleum industry. In particular, this book provides a market segmentation of the petroleum industry and how IBM C&P IIF can lead to better productivity and profitability. This book is for an audience that include chemical and petroleum industry professionals, business and functional architects who are looking for ways of improving efficiencies and operating margins. IBM C&P IIF provides a strategic advantage to the chemical and petroleum industry by reducing costs and increasing revenues.